It’s no accident that the large shorebirds we see at the Fill during migration – the dowitchers, snipe, yellowlegs, and pectoral sandpipers – all have eyes near the tops of their heads. 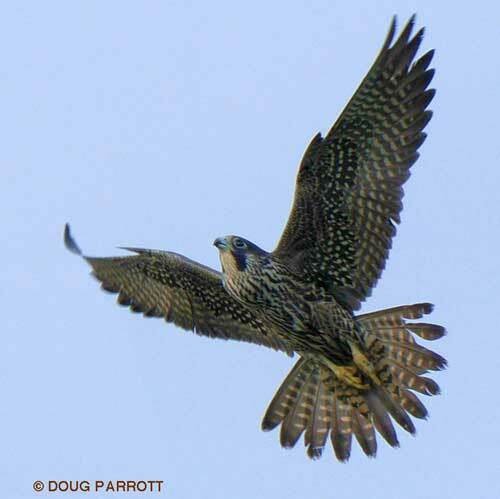 They are the favored food of the Peregrine Falcon and must constantly search the skies to stay safe. Searching the sky is easier if your eyes are already angled upwards. Peregrines, you see, are among the fastest of all birds. When they stoop (i.e., dive) on their prey from above, they have been clocked at speeds higher than 240 mph. That means at top speed, these falcons can cover 200 meters in about 2 seconds. Peregrines are no slouches when it comes to flapping speeds during powered flight, either. At the Fill, they can burst out of hiding and chase down a hapless shorebird so fast the human eye cannot follow. This makes the shorebirds understandably nervous. You can see how wary the shorebirds are as they feed in the mud on Shoveler’s Pond. The yellowlegs seem especially conscious of their delicious vulnerability. They bob and twitch almost constantly, ready to leap into the air in an instant. The dowitchers aren’t much calmer. They stitch their heads up and down in the water like a fast-moving sewing machine, coming up for air and a quick scan of the skies after every stitch. In the military, such vigilance is called situational awareness. It means being aware of everything that happens around you so you spot danger before it spots you. Situational awareness is a critical skill for shorebirds, who are right to be worried about safety. A large female Peregrine has been shopping the neighborhood regularly of late. She flashed by earlier this week, scaring all the birds and exciting all the birders. She was on the lookout for especially weak or unwary prey that would be easy to catch. She didn’t get anything on that pass – the birds were too situationally aware and managed to escape – but she is so big and healthy-looking I know she won’t go hungry for long. Humans at the Fill, by contrast, seem to have almost no situational awareness at all. Civilization has contrived to keep us at the top of the food chain for so long, we have little sense of danger when we venture forth, ear buds in place and thumbs in the texting position. Not good. We may have deleted our predators from the landscape over the years, but we have not deleted nature as the dominant force in our environment. Lately, I’ve begun to think we should take a page out of the shorebirds’ book and develop more situational awareness of the world around us. Perhaps then we would realize that nature still controls our lives much more than we would like to think. As an old TV ad used to remind us, “You can’t fool Mother Nature.” At least, not for long. This entry was posted in Uncategorized on July 24, 2010 by constancesidles.